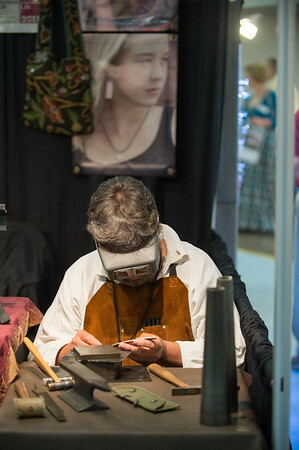 JOED VIERA/STAFF PHOTOGRAPHER-Lockport, NY-Jeffrey L. Jobe makes a Hebrew bracelet out of sterling sliver at the Kenan Center during their 100 Craftsman event. Jobe is a historical archeologist turned artisan in 1993 when a department store paid to have him learn how to do gold work. "I was a happy archeologist but I'm an even happier artisan"